The Canyon Creek is on Sale! | Was $92,511 | NOW: $71,240! The Canyon Creek model has 4 Beds and 2 Baths. This 1387 square foot Double Wide home is available for delivery in Idaho, Washington, Oregon, Montana, Wyoming, North California, North Nevada & North Utah. With generous size, countless modern amenities and an affordable price tag, the Canyon Creek is ideal for the larger families but will be appreciated by all. The four-bedroom, split floor double wide features a stunning kitchen, generously proportioned rooms and a luxurious master suite. 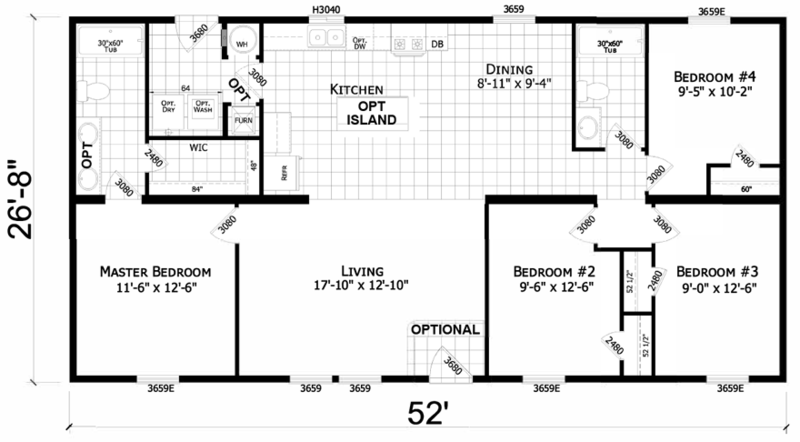 The optional kitchen island would make a nice addition. Ask your housing consultant about the other great features that come standard on the Canyon Creek manufactured home.